The new Mac Pro is possibly one of the coolest looking workstations ever made. Though it has been compared to everything from a trashcan to Darth Vader's helmet, there's no denying that it's a welcome change from a standard tower. Plus, inside, it's a monster. Apple intends this to be a computer you can keep for up to ten years. The components it crammed into the Mac Pro's surprisingly small case may just be able to hold up that promise. The new workstation also uses up to 70 percent less energy than the previous version and is only one eighth the size. The base model features a 3.7 GHz quad-core Intel Xeon E5 processor, dual AMD FirePro D300 GPUs (2 GB of VRAM each), 12 GB of RAM, and a 256 GB PCIe SSD. A bigger model is also available with a 3.5 GHz hexa-core Intel Xeon E5 processor, dual AMD FirePro D500 GPUs (3 GB of VRAM each), 16 GB of RAM, and a 256 GB PCIe SSD. Still not enough for you? Configure-to-order options can take it up to dodeca-core (read 12 cores) Intel Xeon E5 processors, dual AMD FirePro D700 GPUs (6 GB of VRAM each), up to 64 GB of RAM, and up to 1TB of PCIe SSDs. The new Mac Pro will be available in December. The two ready-to-ship configurations are priced at US$2999 and US$3999 respectively. 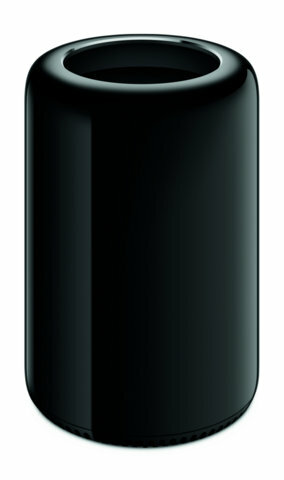 SAN FRANCISCO—October 22, 2013—Apple® today redefined pro computing with the launch of the all-new Mac Pro®. Designed around an innovative unified thermal core, the Mac Pro features the latest Intel Xeon processors with up to 12 cores, dual workstation-class GPUs, six Thunderbolt 2 ports, PCIe-based flash storage and ultra-fast ECC memory. Packing amazing performance in a stunning new design, the all-new Mac Pro starts at $2,999 (US) and will be available in December. “From the blazing fast performance of DaVinci Resolve to real-time video capture with UltraStudio 4K, Mac Pro is a revolution in pro desktop design and performance,” said Grant Petty, CEO of Blackmagic Design. Featuring an incredible six Thunderbolt 2 ports, each with up to 20Gbps of bandwidth per device, the all-new Mac Pro completely redefines desktop expandability. Thunderbolt 2 ports support up to six daisy-chained devices each, giving pros the ability to connect up to 36 high-performance peripherals—from external storage devices, to multiple PCI expansion chassis, to audio and video breakout boxes. Thunderbolt 2 uses existing copper or optical Thunderbolt cables and is completely backward compatible with existing Thunderbolt peripherals and cables, and also supports the latest 4K displays. A new self-configuring IP over Thunderbolt software feature in OS X Mavericks provides a fast link between Thunderbolt-enabled Macs. The new Mac Pro provides unparalleled power for Apple’s professional apps, including Final Cut Pro® X, Logic® Pro X and Aperture®. Final Cut Pro X has been optimized to support dual GPUs for improved real-time playback performance, faster rendering, quicker export, and 4K video monitoring through Thunderbolt 2 and HDMI. Flash storage makes importing and exporting thousands of high-resolution images faster with Aperture. Logic Pro X takes advantage of flash storage for incredibly fast project load times and Thunderbolt 2 for a high number of channels of ultra-low latency audio I/O without the need for add-on PCI cards. The new Mac Pro ships with OS X Mavericks. Mavericks is the 10th major release of the world’s most advanced operating system and is available for free from the Mac App Store℠. In addition to more than 200 new features, Mavericks introduces features for power users including Finder® Tabs, Tags and enhanced multi-display support, as well as new core technologies for breakthrough performance such as Compressed Memory to keep your Mac fast and responsive. Mavericks also delivers significant performance enhancements for systems with dual GPUs through optimized OpenGL and OpenCL. For more information or to download Mavericks visit www.apple.com/osx/. The all-new Mac Pro will be available in December through the Apple Online Store(www.apple.com), Apple’s retail stores and select Apple Authorized Resellers. The Mac Pro is available with a 3.7 GHz quad-core Intel Xeon E5 processor with Turbo Boost speeds up to 3.9 GHz, dual AMD FirePro D300 GPUs with 2GB of VRAM each, 12GB of memory, and 256GB of PCIe-based flash storage starting at $2,999 (US); and with a 3.5 GHz 6-core Intel Xeon E5 processor with Turbo Boost speeds up to 3.9 GHz, dual AMD FirePro D500 GPUs with 3GB of VRAM each, 16GB of memory, and 256GB of PCIe-based flash storage starting at $3,999 (US).